Microgrid projects are integral to initiatives that aim to strengthen the economy, save lives during natural disasters, and make our energy supply more sustainable and our electrical power more secure. Microgrids increasing support more reliable, efficient and safe power for critical infrastructure in military, utility, healthcare, government, university, residential, and other applications. The primary driver for microgrids is the ability to deliver reliable, clean power to critical facilities during an extended period by islanding or operating independently of the utility grid. A microgrid can better manage local power generation by providing optimal control, dynamic stability, and balance demand and generation on a small but critical scale. Simply put, a microgrid is small-scale, local power grid that can operate either connected to the utility or independently. 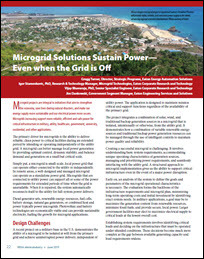 In remote areas, a well-designed and managed microgrid can operate as a standalone power grid. Microgrids that are connected to utility power can support all or some of the power requirements for extended periods of time when the grid is unavailable. When it is repaired, the system automatically reconnects itself to the utility for full-system power delivery. Diesel generator sets, renewable energy resources, fuel cells, battery storage, natural gas generators, or combined heat and power typically power microgrids. Photovoltaic and battery technologies are economically viable and can provide sustainable electricity, fueling the growth for microgrid applications. To learn more about clean, efficient sustainable power download this white paper.